Summer is officially here which means it’s time to enjoy the great outdoors! The summer heat can take a toll on your lawn so how can you take care of your lawn during the heat of the California summer while being water conscious? 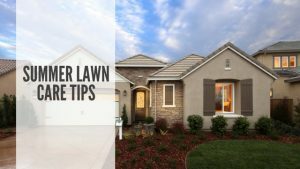 While the summer heat can take a toil on your lawn, here are some simple lawn care tips to keep your yard looking lush and gorgeous this season. The best time of day to water your lawn is in the morning. Why morning? Not only does it give your grass ample time to absorb the moisture before it evaporates, it also gives it time for the sun to properly dry the area to reduce the fungal growth. When it comes to watering your lawn, take a cue from nature and water it deeply but infrequently. This will encourage the grass to grow deeper roots by forcing it to search for water, which helps them to sustain themselves during times of drought. Finally, inspect your sprinklers to make sure they’re positioned and working correctly; there’s nothing worse than finding out you’ve been watering the driveway instead of the yard! You can make the job easier by setting up timers to keep your watering on schedule. Mowing is the most time-consuming task of regular lawn maintenance. It’s tempting to cut the grass blades really short so you don’t have to mow as often but resist that urge. It’s heathier for your grass if you leave them higher. How so? Taller grass provides shade to the soil and cool it, meaning you have to water less often. Since you’re watering less often, that gives the grass time to grow deeper roots and prevents wees from growing. And what’s worse than mowing? Weeding. Be sure to keep your mower blades sharp. Dull blades tear at grass blades instead of cutting, which causes the ragged, grayish brown edges. A good rule of thumb is to avoid cutting more than 1/3 of the grass blade at each cutting. When you mow, leave the grass clippings on the lawn. Using grass clippings as mulch helps keep the soil’s moisture levels steady and feeds your lawn, saving you time and money on fertilizing. From lawn chairs, kiddie pools or toys, a lot of fun happens on our lawns. Make it a habit to pick up these items from the yard at the end of each day. Picking everything up prevents damage to the grass and keeps the area clear when it’s time to mow. Spot may be the cause of all your spots. Avoid those unsightly dead patches by creating a mulched or gravel area your dog can use for bathroom breaks and pick up any waste quickly. You can train your dog to use the new area the same way you house trained them. These simple tips will keep your lawn looking heathy all season long.